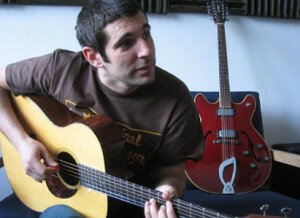 The debut album from JONAH MATRANGA released by Arctic Rodeo Recordings was recorded by his labelmate IAN LOVE (RIVAL SCHOOLS, BURN, DIE 116, CARDIA) who also plays guitar on the album called AND. Ian Love, who plays as a solo artist (his album was also released by Arctic Rodeo Recordings), co-produced the album and also plays guitar on it. He was noted for his recent work with Earl Greyhound ans Walking Concert. Further, SAMMY SIEGLER (YOUTH OF TODAY, CIV, RIVAL SCHOOLS) is playing drums on the recording. Jonah Matranga and his art are essentially unclassifiable. His music lies somewhere in between Elliott Smith, U2 and Cheap Trick, but it doesn’t really fit into any genre. Over the last 15 years, he’s fronted hard rock bands (Far, Gratitude) and made classic indie records (onelinedrawing, New End Original). He’s made records with budgets ranging from $300 to $300,000. Jonah has influenced artists from Deftones to Blink-182, but he sounds nothing like either of them. He’s toured with artists from The Weakerthans to Sepultura, and has respect from people all over the music world. He’s recently turned up on hip-hop records from Fort Minor and Lupe Fiasco. Jonah has played as many house shows as he has huge festivals, and he brings the same thing regardless of where he’s playing — accomplished, ambitious songwriting, an abundance of wit and honesty, and an interest in making something new every time. There is no one quite like Jonah. – Jonah, Jan2006, San Francisco.